Last week I criticised Blue Jasmine for being too depressing yet there I was yesterday watching How I Live Now. This is a film where a teenage girl is sent from America to the UK because her mother has died and her father doesn’t want her around. She doesn’t initially get on with the cousins she is staying with but no sooner has she settled in to this new way of life than nuclear war breaks out. She is subsequently dragged away by the army to work menial tasks sorting the few crops remaining that haven’t been contaminated by the fall out. Oh, and she also has to deal with a war stricken populace who are at best disenchanted and unfriendly and at worst feral and violent. There aren’t a lot of laughs. My issue with Blue Jasmine though is that it portrayed the common problems of normal people and I actually find that more of a downer than something like this which shows people surviving in extraordinary circumstances, bleak as it is. Of course, Woody Allen’s movie could boast some great acting and that is something it also shares with How I Live Now, which has Saoirse Ronan as the ace card in its pack. 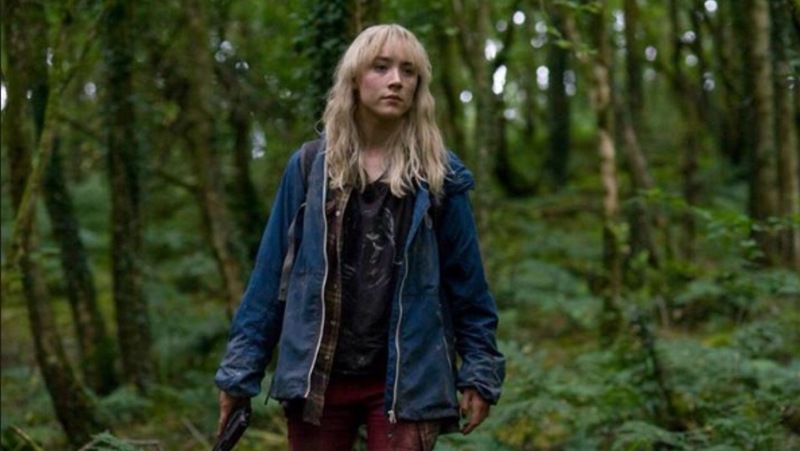 Saoirse Ronan is a staggering young actor. She was impressive enough in 2007’s Atonement but it was her breathtaking performance in Peter Jackson’s film of The Lovely Bones two years later that really set her out as one to watch. In fact it was her work in front of the camera that really held that film together. Then two years after that she provided the maladjusted heart at the centre of Hanna, a film that divided opinion but was one of my favourites of the year, and just four months ago she put in another mesmerising act in Byzantium. This last movie was, to my mind, an overblown yet underestimated gothic masterwork and once again this was largely down to Ms Ronan (taking nothing away from Gemma Aterton who was also excellent). Ronan has already been Oscar and BAFTA nominated and while she has yet to win any major awards, it is an absolute certainty that she will sooner or later. She is a simply fantastic and captivating screen presence whose intelligence shows in her performances and the kid is still only nineteen. How I Live Now is another film that would be much the poorer without her in it. The first thing to say in offering a critique of this movie is that I don’t think I am really the target demographic. It is based on a very successful ‘young adult’ novel and features a dreamy romance between its two central teenagers. I’m not sure if this adaptation is necessarily designed to appeal directly to the bereft Twilight fans in the same way as films like The Mortal Instruments, I Am Number Four and The Hunger Games but it may well appeal to those who like their heroes under twenty, mopey, lovelorn and female. Considering these other movies it feels refreshing that this story has no supernatural or sci-fi elements and interestingly some of the characters are telepathic in the original book but this has been dropped here. As a male viewer many many years past teenagerhood I wasn’t initially moved by the young lovers and did have a small problem with the fact they are first cousins but I guess times were hard. Certainly the film is a little schmaltzy in places (the tag line is ‘Love Will Lead You Home’) but when military rule separates the couple and the heroine attempts to journey back to the idyllic country residence she and her boy shared and I was glad to follow her. This romantic pilgrimage drives the second half of the film and it is highly compelling. Watching it you understand how she would absolutely need something to hold on to and to push her forward in the face of such hopelessness, even if she has only just met the guy. The other thing that dawned on me during the movie was the terrible tragedy of war and what it does to people’s lives. Clearly this was not a new concept to me but seeing a Britain ravaged by conflict with cars burnt out by roadsides, buildings destroyed and dead bodies left to decompose, the familiar disfigured by conflict, only served to bring home (literally) how this is normal for too many people across the world. It highlighted how others cannot take the liberty and safety we enjoy for granted. This is a world where normal people do unspeakable things whether it be through barbarism or just through the need to survive. It isn’t just the bad guys who are quick to kill. There are so many films that will happily show you a city destroyed but finally here is one that shows the true implications of what that means. How I Live Now is occasionally cheesy but it also has an honesty missing from most movies and that is to be applauded. Imagine 28 Days Later minus the Zombies and the up beat ending. Some people survive, sure, but they are damaged. As I watched this film the feel good Sunshine On Leith was playing in the screen downstairs, yet I am glad to have seen the flick where someone really does actually walk 500 miles and does so with a child in tow. If you’ve ever done a school run on foot you’ll appreciate this for the true feat of endurance it is. Ultimately the word I would settle on for How I Live Now is interesting. Occasionally moving, often riveting, partially soppy, never amusing but always interesting. I’m sure there aren’t many of you who are going to search this one out at the cinema but I recommend you keep it in mind for a future rental. How I Live Now is rated 15 and while it has something to give for people older than that it certainly isn’t for anyone younger. This is properly the stuff of nightmares and that is the voice of experience from someone who had to work through the whole fear of nuclear war thing in his early teenage.